They’re back… LEDs now at H-E-B for 97 cents! Update: Thank you San Antonio! All of the 200,000 LED bulbs offered at H-E-B have been sold! These days, anything you can buy for less than a dollar is considered a steal. Forget your candy bars or packs of gum. How about an LED light bulb that uses one-fourth of the energy a conventional bulb uses, lasts 25 times longer, and costs just 97 cents? That’s a steal. CPS Energy is offering this one-of-a-kind discount now at all San Antonio H-E-B stores. For a limited time, you can pick up a 9.5-watt, soft-white LED bulb − which is equivalent to a 60-watt incandescent bulb − for only 97 cents with an in-store coupon. You can purchase up to three bulbs per visit or transaction. That’s less than a buck for a long-lasting, high-efficiency light bulb that retails for almost $7. CPS Energy is picking up the tab on the $6 difference. 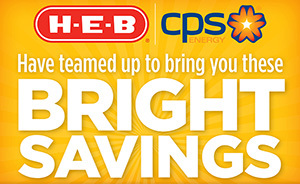 Last November, 200,000 LEDs were sold in just 10 days through a similar offer at H-E-B, sponsored by CPS Energy. If you missed that deal, take advantage of this offer before it’s too late! The bulbs will go fast. This offer will not only help you save on your grocery bill, but on your energy bill, too. LED bulbs are the latest game changer in energy efficiency for your home or business. According to Energy Star, LED lights use less energy, emit less heat and last longer than conventional, incandescent bulbs. High quality (or Energy Star®-qualified) LED bulbs use at least 75% less energy than incandescent lighting. LED bulbs last 25 times longer than incandescent lighting and about 2 to 5 times longer than fluorescent lighting. Get ’em now before it’s too late! I went to my local HEB on 4-29th after receiving our Corporate email and they didn’t have a display or coupons for the led lights. Should i have visited another HEB or did i already miss out? unless you are one of the 100,000 customers that live in a different County than Bexar in which case HEB won’t honor the discount. Another reason to not trust what CPS is telling you! Drove 20 miles too nearest HEB only to be told they were not participating. Afte speaking with the manager I would have assumed they would have met the sale price for customer satisfaction to keep a customer who has been shopping at HEB since 1974. Well I was wrong and I will never step foot in HEB again. looks like Walmart from now on. And to think my very first job b was at HEB on Babcock Rd. in 1985. I’m sorry you had trouble attempting to take advantage of our LED offer. Yes, as explained on the blog and in other communications, it was for San Antonio-area HEB stores only. CPS Energy serves the greater San Antonio area. Funds used to purchase these bulbs and provide them at a discount at HEB stores were provided through our Save for Tomorrow Energy Plan funds. This program is supported through customer bills. Therefore, the discount was made available at HEB stores located in our service area. It appears almost all of the 200,000 bulbs have been purchased — in less than one week! Again, we’re sorry for the confusion, but are hopeful you will continue to seek energy-saving LEDs and other appliances. Like other technologies, LED bulbs continue to become more affordable and are great long-term solutions to saving energy. I,too, went to my neighborhood HEB last evening and no special display or even a section of the regular bulbs aisle had any markings of a special LED. Know that LED’s are a good value but at their high price outside of this offer I’ll just have to wait when offered again. Very disappointed. I’m sorry that occurred. Believe it or not, but all of the 200,000 LEDs were sold in less than 4 days. Last year, that many sold in 10 days. I’m sorry you were not able to purchase any. We will look into a similar offer next year. Thanks for your interest in saving energy and LEDs. Went to many (no less than 5) HEB stores several times during the time period, all on north side of town. None had promo going, or knew anything about it. I wonder if it was concentrated to only certain parts of town. I’m sorry to hear you had a problem with finding the LEDs at an HEB store. They were sold at every San Antonio-area store. However, they were only available for one week as they sold out very quickly — all 200,000 bulbs. I hope we will offer the program again later this fall. LEDs are a great energy-saving option for the average home. They are starting to go down in price, so I encourage you to seek them out at HEB, WalMart, Lowes, Home Depot and similar stores.